Distractions are everywhere in the office. The result is that employees can find it very challenging to remain focused, and often give in to the temptation to check their phone, mess around on the computer, or talk or text their friends. According to CareerBuilder, one in five employers notice that their employees are productive for less than five hours. The biggest productivity killer is the cell phone. The internet and simple gossip follows right behind. While you can’t get rid of all distractions, you can change the way your office runs to improve productivity on a daily basis. Of course, there’s more to productivity than just working all day. 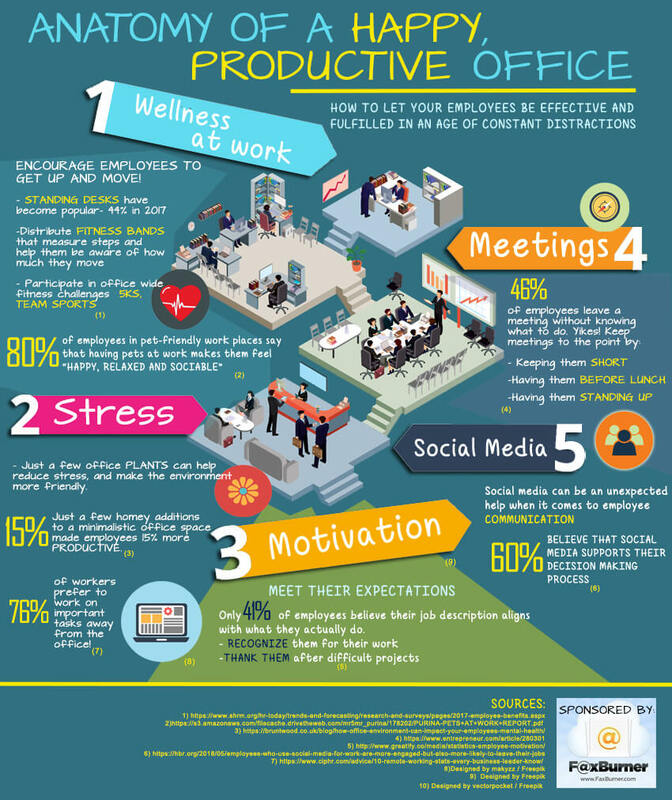 Here are some proven tips for promoting a happier, more productive office. Don’t encourage your staff to stay seated at their computers all day. Instead, promote wellness and fitness with simple tricks like letting your employees use standing-desks (we’ve even heard of treadmill desks). This trend has become popular recently with 44% of people in 2017 choosing to stand at their desks. You can also give your staff incentive to get up and move around by promoting the use of (or even distributing) fitness bands or trackers during break time. Consider creating a sort of fitness challenge in the office or have a day to play team sports together. Not only will this promote productivity, it can help staff build camaraderie and to feel more comfortable with one another at work. Encouraging professional and personal development at the workspace keeps employees happier, more cooperative, and more focused – all of which promote productivity. In addition to increasing output, promoting wellness in the workplace also improves the daily life and well-being of your employees. Many workers prefer to work on important tasks away from the office. And it’s certainly worthwhile to consider allowing remote work – as long as goals are met. But it also wise to make the office environment less stressful and more comfortable. According to a study by Robert Half International in 2012, work environment is the most crucial factor in staff satisfaction. As many as half a million people were affected by stress and anxiety in the 2016/2017 working year, with the numbers climbing every year. Stress makes it difficult to work, which is why many employers are now working to make changes to the office to help their workforce feel more at home. Pets are a known stress reducer, so it’s no wonder that some office spaces are allowing cats and dogs nowadays. In fact, 80% of employees in pet-friendly work spaces say that they feel much happier, more relaxed and sociable. Pets not an option? How about plants? Classical music? Better lighting? More comfortable chairs? Inviting employees to customize their work spaces? People are 15% more productive with small office additions that make them feel more at home. Reducing stress increases focus and productivity so make your office more comfortable and inviting is bound to pay dividends. Productivity in the office can be improved by using smart tools and technologies to make work easier, faster and more efficient. 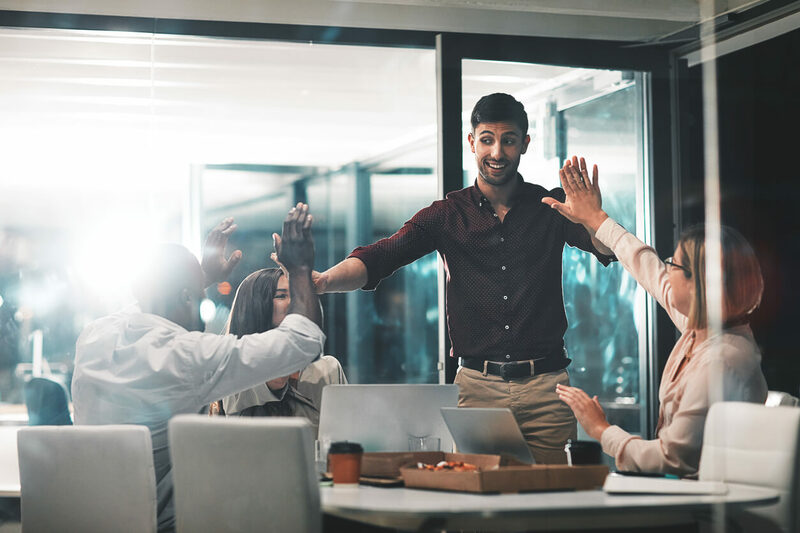 More streamlined processes, using apps and tools can save overall employee time, making the team able to do more with less stress or frustration. You can use Slack for better team communication, share and save your important documents with DropBox, fax documents using email or smartphones with FaxBurner’s fax app, make sales calls with PhoneBurner, save your best ideas to Evernote, track time spent on tasks with Toggl or Time Doctor, automate appointment setting with Calendly, and improve your writing skills with Hemingway or Grammarly. What do your employees spend (or waste) time on? Search for tools that can automate these processes so they can focus their attention where it matters most. Employers can do a lot to influence productivity by motivating employees. One of the best and most important ways is to set expectations so that employees can stay on point. Set goals to keep them reaching. Gamify productivity when possible to make things competitive and fun. When you consider that only 41% of the workforce think their job matches up with their job description, it’s clear how important of a role expectations can play. Showing appreciation is another great way to motivate employees (and it makes them happier too). Talk to your employees to show them that they are important and recognize them for their work. Go out of your way to thank them after difficult projects. Celebrate and reward victories. Create a platform for employees to share success and high-five each other (virtually or otherwise). It’s also critical to make sure employees feel valued. Use collaborative language so employees feel as though they have a say in their own work. Promote creativity and be open to ideas no matter where they come from. When employees feel invested and interested in the projects they take on, they excel. The opposite is true when they’re doing something just because they’ve been told to. Almost 50% of employees do not know what they’re supposed to be doing after leaving a meeting. This is partially because meetings tend to drag on as people doze off or stop paying attention. You can combat this by keeping meetings short, holding them before lunch, and even having your staff stand up. It’s also critical to have an agenda and a timeline. And to stick to them! Having this focus keeps participants attentive and on point. While most employers believe that social media is a distraction, it can help with employee communication and interaction. In fact, 60% of people believe that social media supports their decision-making process as they collaborate, share ideas and solve problems together. As much as 82% of staff notice the way social media improves their work relationships. With improved relationships at work, people are more likely to show up happy, and work collaboratively. The challenge is keeping the social media related to work. So be sure to set limits and expectations – and hold employees to them. There’s a lot that goes into office productivity. Beyond simply encouraging your employees to work more, you can improve their focus and output. Create a less stressful environment, make employees feel appreciated and alter the structure of meetings and work itself. Even a few simple changes can make your employees feel much happier. You will be more successful in encouraging them to work harder as they feel more connected to both your company and you. We summed up all the above in a visual infographic, a cheat sheet you can use to create a happier, productive work environment.